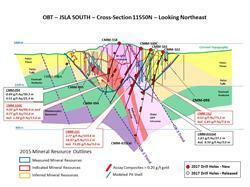 TORONTO, ON--(Marketwired - June 06, 2017) - NewCastle Gold Ltd. (TSX: NCA) (NewCastle Gold or the "Company") is pleased to report the latest assay results on the southern portion of the main Oro Belle Trend ("OBT") within the region of the historic JSLA pit at the Castle Mountain gold project (the "Project") in San Bernardino County, California. The results from CMM-161 are very encouraging, returning 2.77 grams per tonne gold ("g/t Au") over a large interval of 103.6 metres including 16.47 g/t Au over 15.2 metres, below the modeled pit bottom and approximately 100 metres up-dip from CMM-031Ext (1.63 g/t Au over 27.1 metres, including 9.50 g/t Au over 3.0 metres in the September 6, 2016 press release). The OB-2 and OB-3 Zones, and the intervening corridor which hosts the bulk of felsic intrusive activity and brecciation, remains open along strike to the north and south, as well as at depth. Gerald Panneton, President and CEO commented, "The Company's definition drilling program continues to generate high-grade mineralization intercepts outside the previously announced 2015 mineral resource. The current program has definitely achieved its objective to demonstrate that the deposit is still open in all directions and that the average grade of the resource could be significantly increased." All new core and RC holes were drilled at 290 degrees azimuth, with dips of -50 or -60 degrees and to a range of depths from 213 to 457 metres. True widths of the intercepted intervals are estimated to be 70% to 90% of intersected widths based on available geological information. The Company remains on target to revise its current mineral resource statement by the end of September 2017. Half-sawn core and reverse circulation drill samples were submitted to ALS Minerals in Reno, Nevada for crushing until 70% of the sample is finer than a nominal two millimeters in size. A 250 gram ("g") sub-sample is taken from the crushed material and pulverized until 85% passes a 200 mesh (75 µm) screen (ALS Method PREP-31). A 30 g portion of pulverized material (pulp) is then sampled and subjected to fire assay ("FA") with atomic absorption ("AA") finish (ALS Method AuAA-23). Any gold assays greater than 10 g/t Au are re-analyzed where a 30 g portion is taken from the pulp and assayed by FA with a gravimetric finish (ALS Method Au 30 g FA – GRAV). All samples that yield greater than 0.2 ppm assay are also analyzed for gold cyanide solubility (ALS Method AuAA-13). Half-sawn core and reverse circulation drill samples drill samples were also submitted to Inspectorate America Corporation in Sparks, Nevada for crushing until 70% of the sample is finer than a nominal two millimeters in size. A 250 g sub-sample is taken from the crushed material and pulverized until 85% passes a 200 mesh (75 µm) screen (Method PRP70-250). A 30 g portion of pulverized material (pulp) is then sampled and subjected to fire assay ("FA") with atomic absorption ("AAS") finish (Method FA430). Any gold assays greater than 10 g/t Au are re-analyzed where a 30 g portion is taken from the pulp and assayed by FA with a gravimetric finish. All samples that yield greater than 0.2 ppm assay are also analyzed for gold cyanide solubility (Method CN403). Ian R. Cunningham-Dunlop, P. Eng., the Company's Senior Vice President Technical Services, is the designated Qualified Person for this news release within the meaning of NI 43-101. He has reviewed and verified that the technical information contained in this release is accurate and has approved of the written disclosure of the same. 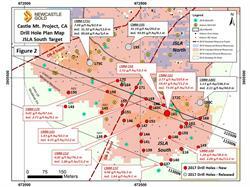 NewCastle Gold (an augustagroup company) has a 100% interest in the Castle Mountain property in San Bernardino County, California. The Castle Mountain heap leach gold mine produced over one million ounces of gold from 1991 to 2004. The Mine and Reclamation Plan, under which the mine operated, was authorized by the County of San Bernardino as the Lead Agency and remains in effect. Water for the drill programs was accessed from existing patented wells on the Project. An updated NI 43-101 resource for the Project was announced December 2, 2015 which includes Measured Mineral Resources of 17.4 million tonnes grading 0.86 g/t gold containing 0.48 million gold ounces, Indicated Mineral Resources of 202.5 million tonnes grading 0.57 g/t gold containing 3.71 million gold ounces along with Inferred Mineral Resources of 40.8 million tonnes grading 0.58 g/t gold and containing 0.76 million gold ounces. The Project hosts a disseminated low sulphidation epithermal system. 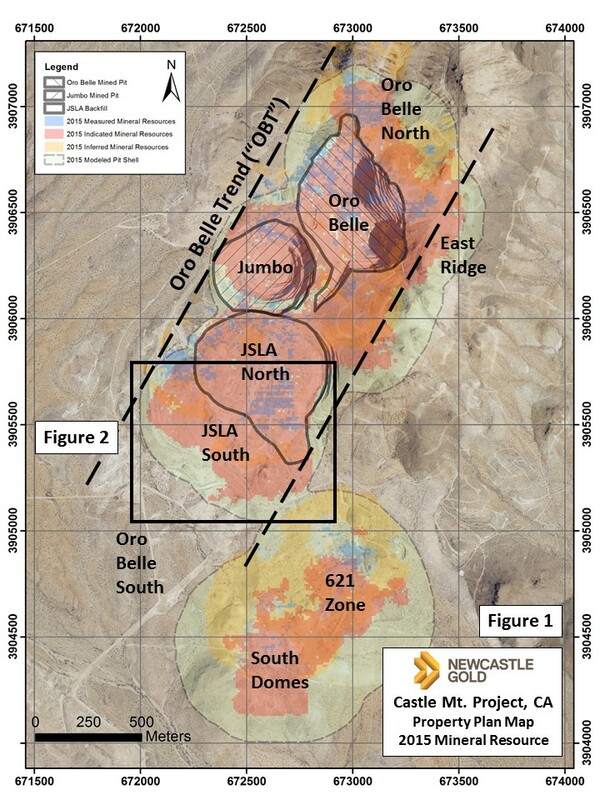 Gold is primarily hosted by late-stage rhyolite volcanic units within zones of silicification and brecciation associated with northeast-southwest trending/southeast dipping fault structures which are interpreted to have developed within a collapsed caldera environment. 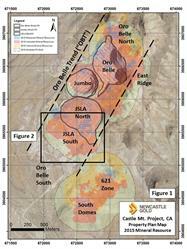 Eleven gold domains are represented by both steep and shallow-dipping orientations. Neither the TSX Exchange nor its Regulation Services Provider (as that term is defined in the policies of the TSX Exchange) accepts responsibility for the adequacy or accuracy of this news release. This news release contains "forward-looking statements" and "forward-looking information" (collectively, "forward-looking information") within the meaning of applicable Canadian securities legislation. 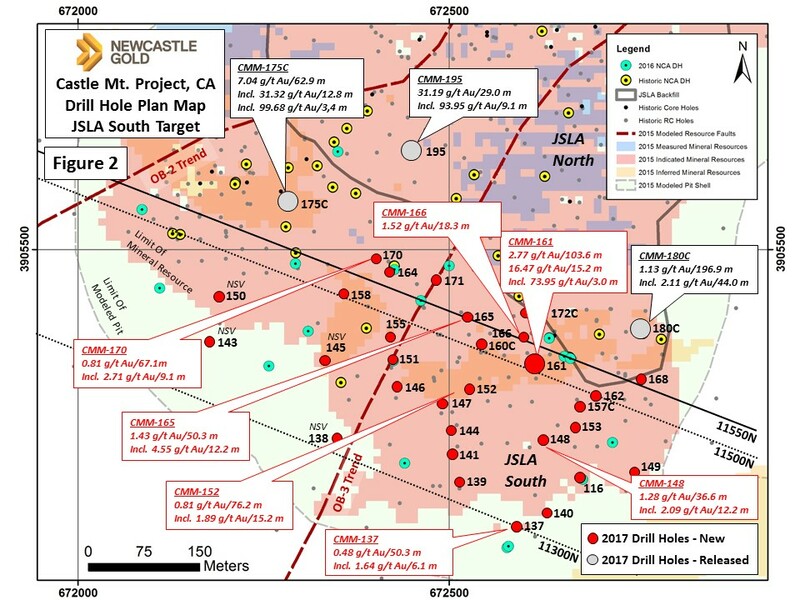 Forward-looking information includes information that relates to, among other things, statements with respect to the drill program at Castle Mountain, the mineral resource expansion at Castle Mountain, the identification of future expansion targets at Castle Mountain and the restart of operation using Run of Mine (ROM) material from the JSLA pit. Forward-looking information is not, and cannot be, a guarantee of future results or events. Forward-looking information is based on, among other things, opinions, assumptions, estimates and analyses that, while considered reasonable by us at the date the forward-looking information is provided, inherently are subject to significant risks, uncertainties, contingencies and other factors that may cause actual results and events to be materially different from those expressed or implied by the forward-looking information. The material factors or assumptions that we identified and were applied by us in drawing conclusions or making forecasts or projections set out in the forward looking information include, but are not limited to that the Company is able to procure personnel, equipment and supplies required for its exploration and development activities in sufficient quantities and on a timely basis and that actual results will be consistent with management's expectations.